I was pretty excited about this week’s Friday Five! I love to read about other people’s race day rituals and the stories behind them. I can be a little superstitious and maybe some of my rituals are a little kookie but they are all things that I must do before I head out to the starting line of a race. 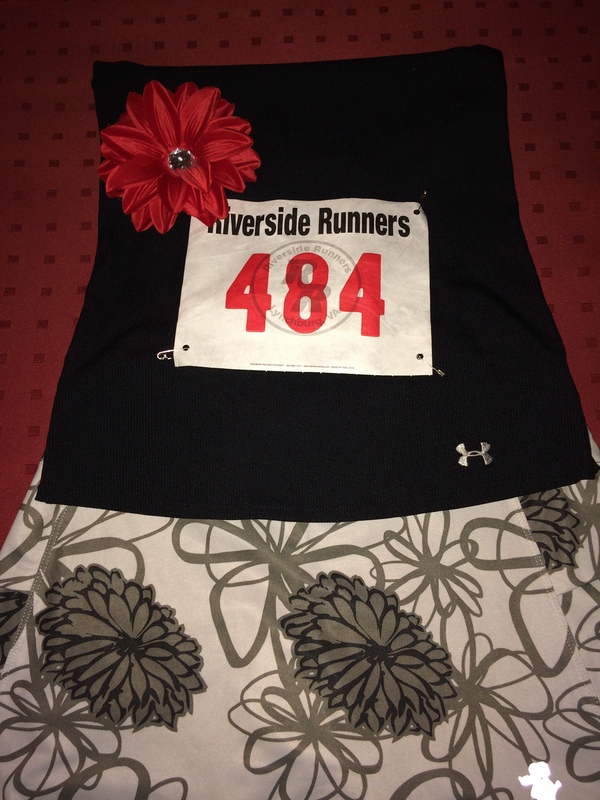 I have to lay out my whole race day outfit and take that all important “flat me” picture. I love coordinating my outfit, which is always a Running Skirts brand skirt (the only one I’ll run in! ), tank, and my Fellow Flower. Sometimes, I choose my outfit around which flower I feel like wearing for a particular race. Each flower has a special meaning! Other times, I choose the flower based on what might look best with the whole outfit. I make sure I have my Garmin, iPod shuffle, and Clif Shot Bloks. When I pick up my race bib from packet pickup, I always try to make my lucky number, 13, with the numbers on my bib or I look for special numbers like previous dorm room numbers, birthdays, patterns with other friends’ bibs, etc. I always feel like this gives me some good running mojo. Like the bib above, the pattern is 4+4 equals 8, which is the middle number. I always treat it like a fun game! 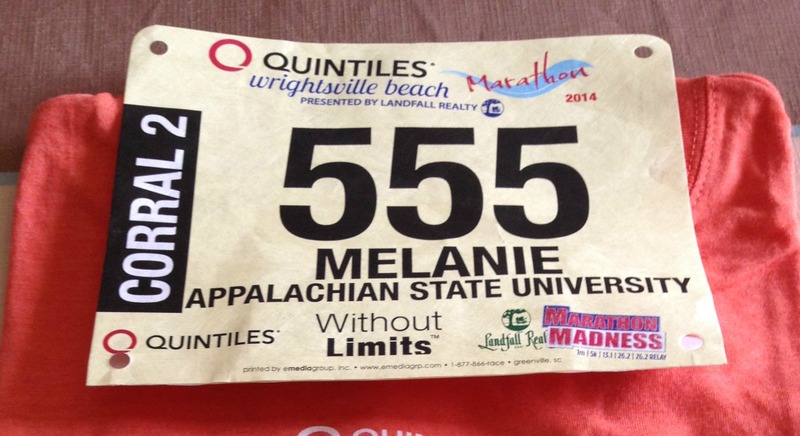 The other thing I’ve done is looked up numerology information about my bib numbers. I look for positive things to draw inspiration from for that particular race. The bib below is my favorite bib yet!! Look at those 5’s! I usually try to eat the same pre-race meal that I had before some of my best races. My most eaten meal is a steak burrito with rice and beans and plenty of chips and salsa. For some reason, it is the perfect mix of protein and carbs and it sticks with me for race day. It’s also the same meal I eat before my big long runs (18-20 milers) during marathon training. On the morning of the race, I have to wake up and take a shower. It’s my time to wake up, get myself together, warm up just a bit and put my myself into the right mindset for the race. It seems silly to do that when just an hour later, I’ll look a hot mess and all sweaty, but it’s part of the ritual for my morning. I feel off if I don’t do it. Mind you on any weekend long run, that is NEVER the case. Maybe if there were photographers hanging out on the Greenway, I’d consider it. I always write an intention with Sharpie on my hand. It’s usually a phrase or something that helps me through rough spots. A visual reminder of why I’m running and what this race might mean to me. 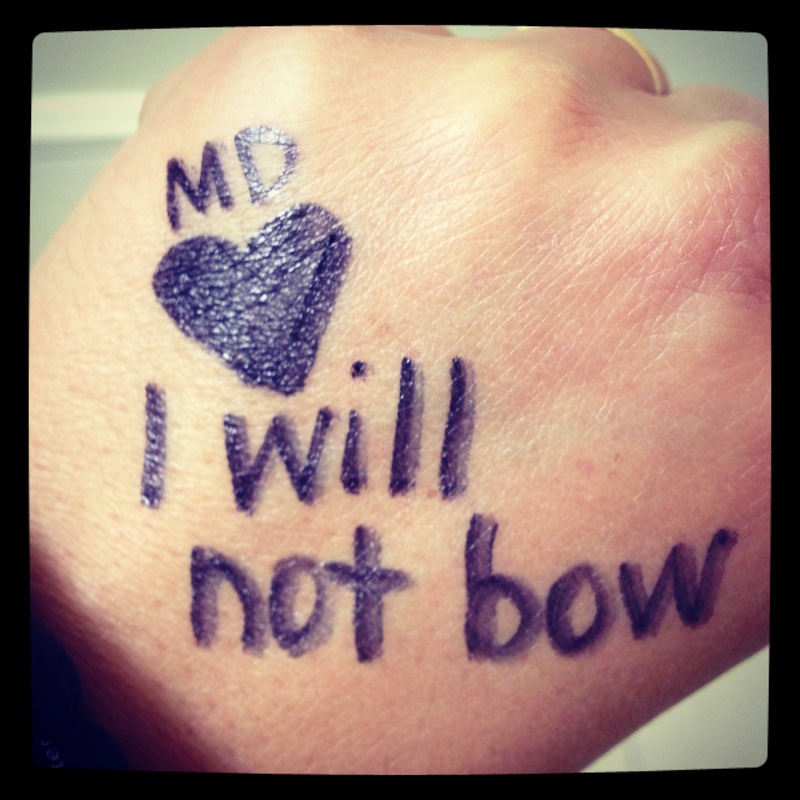 My go-to phrase is “I Will Not Bow” from the Breaking Benjamin song. The lyrics are just awesome and that is the song that I have to find on my iPod when I need a boost during a race. I’ve listened to that song on repeat during many a race. For the Richmond Marathon, I also added in a heart and MD (Maryland) to honor Nick’s grandad who at the time had passed away just before race day. What are your race day rituals and the stories behind them? Check out other awesome race day rituals over at Mar on the Run, You Signed Up For What?, or Eat, Pray, Run DC. Your pre-race meal looks amazing! I usually have pasta. I tried pasta but it just doesn’t stick with me and I’m left hungry or not fueled enough for the race. Once I tried a burrito, it clicked! I love running skirts too! I love all the pockets they provide! Wearing a flower to each race is a cute idea! It’s the only thing I wear now. I’ve become spoiled by them. Give it a try!! You might love it! It just helps me to get going. I like the idea of writing an intention on your hand! I love it– I do the “let me see how this number is meaningful” thing too! I’ve never even thought of showering on race morning (usually too busy running around)- maybe I’ll give it a whirl. I love the idea of a race day intention! It has really helped me to just be okay with whatever my body decides to do that day. Looking down at my hand and seeing that intention just helps! i love the idea of writing out an intention on your hand. that’s awesome! It really helps keep me motivated and centered in a race. Try it!! Do it!! I leave my Sharpie out with my race day outfit. I think I’m going to steal your sharpie idea! I usually have a mantra I repeat when I’m feeling tired but why not have a little ink motivation, too!! Such cool ideas!!! Love this post!! XOXO!! I love love love these! Love the writing on the hand – I really should do that for my upcoming races. Do it!! It’s a terrific motivator to look down and see what your wrote.